A stunning action RPG filled with heroics, adventure, and a diverse assortment of creatures and fiends. 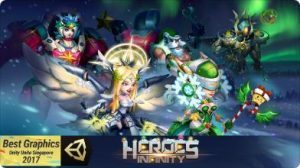 Dive into the world of Heroes Infinity and begin your epic journey through many lands and cities. Collect & build your epic team of heroes to achieve victory. A real-time strategy battle filled with dynamic effects and varied skill animations. Many heroes are waiting for you to Unlock & Combine them into a powerful team. Power Up, Tier Up, Rank Up, and Gear Up to prepare your heroes in their War for Justice. Summon your heroes wisely to gain Victory in the coming battles. Adventure Mode: Gain Experience & Level Up your heroes by defeating your enemies. Skyscraper: Challenge your epic team by conquering many Levels of increasing difficulty. Star Gates: Collect pieces of all the heroes’ shards to Summon the mystery heroes. Training Field: Develop your own skill with heroes in battle to gain victory. Boss Party: Battle with legendary bosses and gain unique rewards. Super Boss: Stay focused when the boss is near. Your epic team have to fight hard. Prove your team’s Strength & Strategy in the 5 vs 5 battle! Compete with other players in the leaderboard and make your way to the top of the PvP. Compatible with iPhone, iPad, and iPod touch. Requires iOS 7.0 or later.